Description: More fun with diamonds and faking prismatic or spectral banding with Bryce. Novice cuts are modeled by me and the square emeralds are by Rosemary. She has an entire very well considered model set of all sorts of diamonds, I just need to find the link and when I do I will edit this description or add it as a comment. Very nice work, Rashad. The velvet cloth looks good but I think I see the terrain. The prismatic effect is quite good. I don't have that sort of tassel laying around here to check whether you got it right. Wow. I really like the lighting and how it reacts with the diamonds. 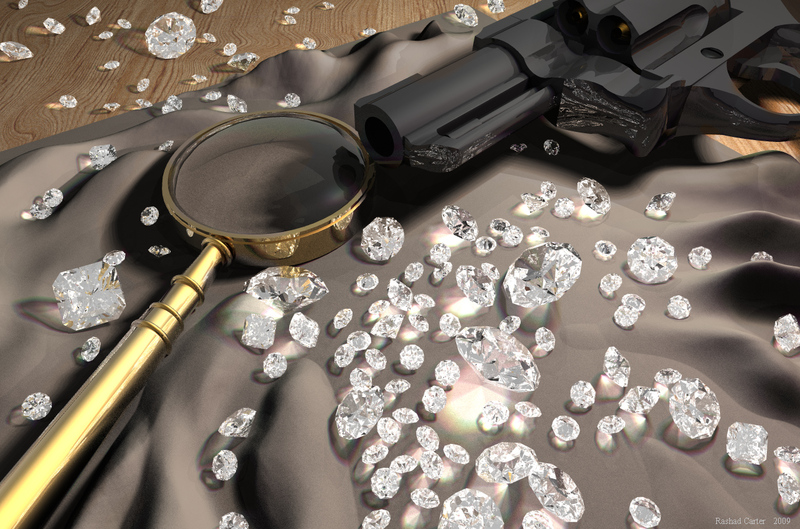 Magnifying glass, gun, bullets, table and diamonds are awesome. The only part that could be improved a bit is the cloth in the upper corner, it looks a little bit too tall. Yeah, that terrain gave me a good deal of trouble. The scene iotself pushed the limits of the Bryce render engine. After dozens of crahses, I discovered an issue of ram usage when rendering with high ray depth and tir settings. For me the prismatic effects are okay, but not yet fully there. I wish I could get more splitting within the diamonds themselves. Right now most prismatic banding appears to be cast outside the diamonds. Still I feel good about this one. This was easily 6 months in the making, off and on. Thanks to both of your for your comments!!!! Six months?!? Wow. It really shows, you have a beautiful picture. I think my favorite part is the magnifying glass with the reflection of the large diamond directly underneath it. Having a shot on the subject myself I'd say that overall the image looks very good to me, but one can say it's still incomplete. Your work on the spectral banding pays off rather well though, considering this is Bryce lacking caustic photonic bounce. I doubt it could be improved much further, although yours is the final word. The prismatic effect is more evident as a sort of photographic chromatic aberration - only two or three distinctive color nuances are apparent, not the "complete" color range. The thing that makes these diamonds look not so real are mainly the strange white-grayish regions inside the gems. It might be because of the reflected sky/hdr backdrop, but this isn't affecting the magnifying glass, so probably it's the different refraction properties. Whatever the reason, you should eliminate the bright regions and consider some environmental backdrop around the diamonds. 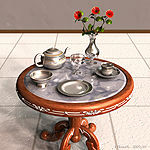 The table texture is very nice, I can almost smell the wood. You shouldn't have stopped here - a nice cloth pattern on the "terrain" would've been nice, few soft eraser strokes in the terrain editor to remove the flat sharp ends, darker version of David's polished Iron applied on the gun (both for bump and the tex pattern), similar on the magnifying glass handle to make it look less Bryce-ish. I think people like you, Rashad, who mastered Bryce's lighting and the other tools to work around the problems and limitations the software has, should really concentrate their effort to make the final render look as less "Bryce" as possible. This is why I mentioned this image is still incomplete. This is my opinion and the way I perceive things when working with Bryce, so you can freely disagree to anything I said :) . Six months is conservative. I actually began laying the ground work for this scene back when I rendered the chess board in blackbox. I later modeled the novice cut and began figuring out methods for creating diamonds. the multifaceted diamonds were mire challengin to light than the smooth edged chess pieces. Hey Richter, I happen to fully agree with your comments. I ran into a couple of technical issues that made this task more complicated than it at first appears. The spectral banding is provided by a light cluster made of 8 different colored lights. The cluster is spherical in shape, and there are 8 radials for each color, the 8 radials for each color are spiraled around the sphere from top to bottom. This was so that I could ensure there was a proper blending of light colors at all areas of the sphere. When the lights are combined they give the appearance of white light. What I find interesting is that when these colored lights pass through the diamonds, the 3 primary colors seem to be the most apparent, almost backward from nature. I wanted to give the impression of a hidden environment, perhaps a basement or small room where these criminal activities can be conducted privately. 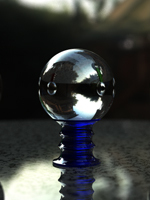 For this reason I was reluctant to use a cool hdri with windows. I also found it challenging to remove most black from within the diamonds. I think the little black we still see within the diamonds results from reflections of the gun. That darned terrain. Honestly, it threatens to destroy the entire impression of the piece, especially for well seasoned Bryce users who know the tools of Bryce. Ideally, I would have used terrain clipping to complicate the edges of the terrain. However, the stones themselves need to appear heavy, heavier than the fabric, so this lead to me flattening the centermost areas of the terrain so much that clipping the edges would have cut holes into the center of the fabric as well. A fabric texture with some visible threading was my original goal. I found that there were issues with the AA, mostly moire patterning and ribbing of lines. So I figured the only remedy would be higher AA quality. Normally that would not be an issue but again these diamonds are unique. I found the render kept crashing even in standard AA because for some reason when rendering at high ray depth and tir setting the page file usage grows continually during render until the file reaches 2gb and crashes. Only when you pause the render then resume it does the page file usage return to normal only to begin to slowly rise up again once the render is resumed. Every 15 minutes or so, I had to stop the render or it would want to crash. Needlessto say, I could not leave the scene to render overnight, I had to babysit the thing very closely. If not for this babysitting issue, I would surely have rendered this at a higher quality with a better fabric. So there are my reasons (excuses) for the truth of your comments. I think I just got tired of the scene and perhaps gave up a bit on the details outside of the diamonds themselves. I plan to test a few more ideas with spectral banding someday soon as jewelry. We shall see. Darn it, I always forget to look at still lifes. Looks fantastic to me with my limited experience so I'll just say that I love the whole idea of the composition with the gun etc. and also the lighting - good one!